Brussels (AFP) - Two French journalists on Thursday told a terrorism trial in Brussels that they had "no doubt" the accused Jewish museum killer is the man who imprisoned and tortured them in Syria. Henin described Nemmouche as a "sadistic, playful and narcissistic" man. 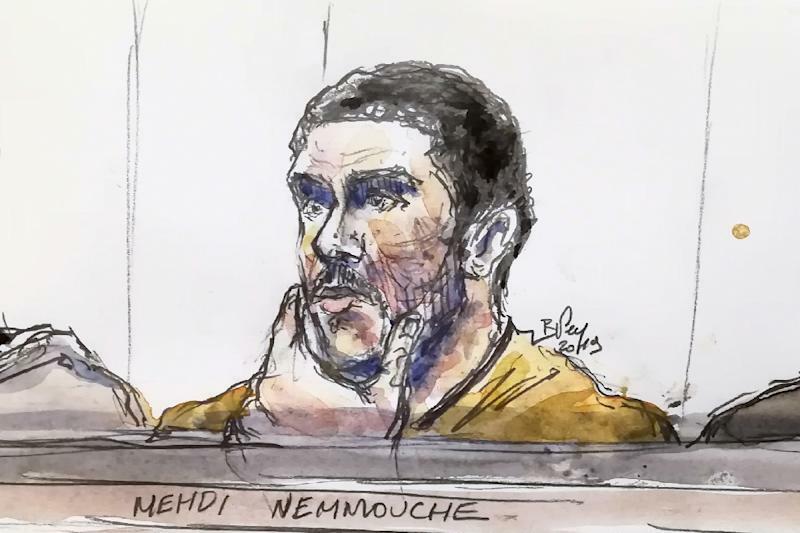 He said Nemmouche expressed "admiration" for Mohammed Merah in the year after he shot dead a teacher and three children at a Jewish school in the French city of Toulouse in 2012. Journalist Didier Francois also said he "had no doubt" Nemmouche was the man who held him hostage. "I came for three things: to say that we know him, how dangerous this person is and the risk he will repeat the crimes," the 58-year-old Francois told the court. Francois alleged that Nemmouche abused him, including hitting him with a club 40 times, while he was held at a hospital turned prison in Aleppo. He added that the violence and "torture" meted out allegedly by Nemmouche mainly targeted Syrians and Iraqis also held there. Michele Hirsch, the lawyer for the Jewish groups, said their testimony was "extremely important" to show the judges and jury what motivated the alleged gunman. It will also show how much his "idol" Merah influenced him, Hirsch added. Nemmouche's lawyers said the journalists' testimony amounts to a "stunt" and a "trial within a trial" because their kidnapping is the subject of separate proceedings in France. Also on trial in Brussels is Nacer Bendrer, a 30-year-old Frenchman accused of supplying Nemmouche with the weapons. Bendrer also faces a life term if convicted of the same charge of "terrorist murder". He allegedly killed an Israeli married couple, a young Belgian employee and a French volunteer. Henin told the court on Thursday that he also recognised among his jailers "Abu Idriss," the alias of the Belgian-Moroccan Najim Laachraoui. Investigators say Laachraoui made the bombs for the November 13, 2015, attacks that killed 130 people in Paris and wounded hundreds of others. Laachraoui was one of the bombers who blew themselves up at Brussels airport and a city metro train on March 22, 2016, killing 32 people and wounding hundreds of others. IS claimed responsibility for both attacks.